Great vinyl, warm recording , must have, chill with Morcheeba! The London Morcheeba consists of singer Skye Edwards, Ross Godfrey (guitar and keyboards) and Paul Godfrey (drums and sampling). They made their debut in 1996 with the album Who Can We Trust. This cd also got rave reviews in our country. 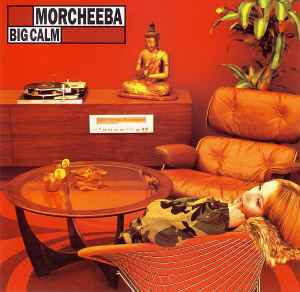 Big Calm France eleven for most mysterious and loom-sounding songs where it seems that Morcheeba the trip-hop stamp have shaken off somewhat. The beautiful but thin voice of singer Skye Edwards is still the most distinguishing feature of Morcheeba. This voice comes into its own in songs like the beautiful opener The Sea, Part Of The process, the fragile Over And Over and the sweeteners sounding and guided by many strings, Fear And Love. The group is experimenting in Friction with dub, in Big Calm with hiphop and for the instrumental Bullet Proof and Bridget Diggin' In A Watery Grave is the electronics Cabinet pulled out. This album is unique to the majority of other trip hop releases in that it is mostly very cheerful. The cover art very much reflects the mood of the recording. In this album, Morcheeba ventures into other genres of music, including jazz, reggae, rock and pop, far more than in their debut Who Can You Trust? and is therefore more versatile. It can easily be enjoyed whether you are relaxing, driving, eating, running, etc. I'd highly recommend it to anyone.